How did we get here--and what happens next? 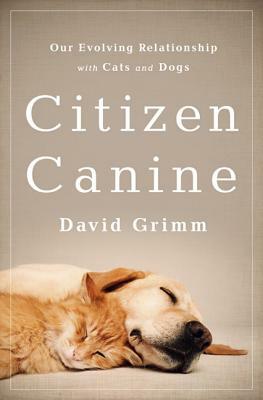 In this fascinating exploration of the changing status of dogs and cats in society, pet lover and award-winning journalist David Grimm explores the rich and surprising history of our favorite companion animals. He treks the long and often torturous path from their wild origins to their dark days in the middle ages to their current standing as the most valued animals on Earth. As he travels across the country--riding along with Los Angeles detectives as they investigate animal cruelty cases, touring the devastation of New Orleans in search of the orphaned pets of Hurricane Katrina, and coming face-to-face with wolves and feral cats--Grimm reveals the changing social attitudes that have turned pets into family members, and the remarkable laws and court cases that have elevated them to quasi citizens. The journey to citizenship isn't a smooth one, however. As Grimm finds, there's plenty of opposition to the rising status of cats and dogs. From scientists and farmers worried that our affection for pets could spill over to livestock and lab rats to philosophers who say the only way to save society is to wipe cats and dogs from the face of the earth, the battle lines are being drawn. We are entering a new age of pets--one that is fundamentally transforming our relationship with these animals and reshaping the very fabric of society. For pet lovers or anyone interested in how we decide who gets to be a "person" in today's world, Citizen Canine is a must read. It is a pet book like no other. David Grimm is a deputy news editor at Science, the world's largest journal of scientific research and science news. He is the recipient of the 2010 Animal Reporting Award from the National Press Club, and has been featured in The Best American Science and Nature Writing. His work has appeared in Science, U.S. News and World Report, The Bark, and The Financial Times. He teaches journalism at Johns Hopkins University and has a Ph.D. in genetics from Yale.